Despite that 2011 is the year of integration, I strongly argue that companies that blindly link away to Facebook and Twitter from their corporate homepages are doing themselves a disfavor. Companies that link away, are sending away their decade of hard earned investments getting customers to come to their website. Instead, companies must have a focused strategy on how you’ll integrate social features and content into your website, rather than padding Facebook and Twitter. 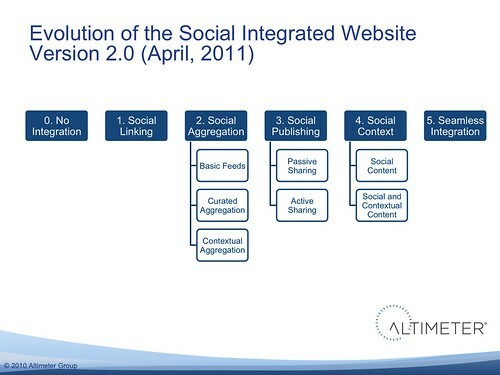 In the below image, you’ll see Altimeter’s latest maturity roadmap (here’s version 1.0 from about a year ago) on how to integrate social into a website based on dozens of interviews and evaluations of existing websites. We recommend that companies quickly get out of stage 0, but skip level 1, and move to level 2 and beyond. To learn more, listen to this webinar that was funded by Janrain and Badgeville for me to present our latest independent research on this topic. We’ll be publishing a formal Open Research report on this topic in the near future –stay tuned. See more data about why Social Integration is so important.